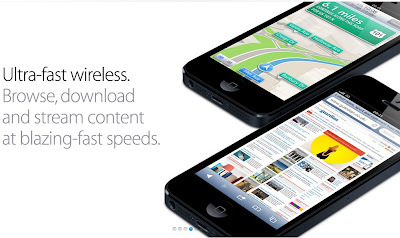 AccuraCast SearchStarz Blog: So, what's different about the iPhone 5? Apple have unveiled the latest instalment of the iPhone this week, with Chief Executive Tim Cook describing it as the "biggest thing to happen to iPhone since the iPhone". This indicates that Apple believe the recent alterations made to the revolutionary smartphone will vastly improve the product and put it miles ahead of its predecessor and competitors. However, this big question is - how exactly is the iPhone 5 different?It appears that Apple have listened to their customers and made improvements based on their feedback, with the latest version including a bigger screen and a longer battery life. The iPhone 5 includes a 4 inch screen, which is half an inch bigger than all previous models, and a more powerful battery, that allows for up to 8 hours of WiFi browsing. In addition to having a larger screen, the handset is 18% thinner and 20% lighter than the iPhone 4S and this certainly makes the iPhone 5 even more competitive against rival offerings. Connectivity is also now vastly improved, as the iPhone 5 offers 'ultra fast wireless' and compatibility with 4G networks. Other improvements include a more powerful A6 processing chip and iOS 6, which claims to be the world's most advanced operating system. In terms of pricing and the memory sizes available, Apple has stuck with the formula that proved so successful for the 4S. However there is one change that has left Apple devotees angry and disappointed, as the company have introduced a smaller USB input and this has meant that all previous iPhone and iPod accessories will be incompatible.